No.3 : The Garibaldi is situated on Albert Street in an area that must be among the best ‘short’ pub crawls in the country. You can visit eight pubs within half a mile – three of them within gobbing distance. It boasts my favourite view of the city – the Garibaldi pub sign with the view of St Albans Abbey in the background, a place of worship with the beautiful cathedral behind. The Garibaldi is the place to come for a perfectly served pint of cask beer. Tenants David and Caroline Beale won the master cellarman of the year award in 2017 beating the rest of the Fuller’s Brewery estate. 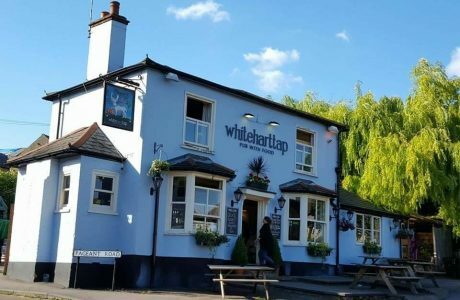 They seem to take pride in every part of their business with a pub with a good atmosphere that is very clean and very much part of the community. Examples of their strong community spirit can be seen through their active fundraising – son Michael running the Brighton Marathon on Sunday 15th April for the NSPCC and tonight Friday the 23rd of March they have a charity Ska and Reggae night in aid of 4 year old Freddie who is battling Leukaemia ( the reason I am knocking this out quick today is to hopefully encourage a few more in tonight). Check out the Garibaldi’s Facebook page if you want to donate. This Victorian pub has one main room with the bar in the centre so you can walk all the way around it. There are lots of nooks, snugs and crannies that make it a real Tardis of a pub – it would be a great location for one of those horror films where the stars are legging it away from the crazed killer and seem to go through a hundred rooms before the axe finally hits. It has a very tidy garden laid with artificial turf. One of the rooms is home to the top of the league darts team who were just off to play an away game in Sandridge. I visited on an early Thursday evening to sample some beers from the ever expanding Fuller’s range including one or two guest beers, starting with a perfectly served London Pride. Lulu the dog was made very welcome as was Elvis with maybe a couple of looks of “ who is this nut job with Elvis!” I first spoke to a guy called Pete who says he likes a pub with a good atmosphere that’s friendly like the Gari and he loves the log fire when it’s roaring away. I then ordered my first ever Unfiltered London pride which is one of Fullers many keg offerings. Whilst being served I got talking to a chap called Kevin who loves a pub with good beer, and bar staff with great tattoos, quite a coincidence really, as I was at that very moment being served by Tattoo enthusiast, Erica the very personable lass behind the bar! Unfiltered beers are a very good addition to pubs for the ever growing numbers of vegetarians who can’t drink beers cleared with fish finings ( Isinglass). However in my opinion the Pride didn’t taste that similar to the usual Pride and wouldn’t sway me from my usual pint. The next beer I chose was again a new one too me, a Fullers “SESSION IPA” a take on a modern hoppy golden IPA , not overly hoppy and maybe brewed with the usual yeasts? I then spoke to Sarah and Rob who liked the Gari as a relaxing local pub, Rob also liking the good beer quality, his favourite being The Seafarers ale which seems I noted has lost all mention of Gale’s brewery heritage on it’s clip now. The locals I spoke to here did not seem to live that close to the pub but considered it to be their local, one chap in the darts team came from Biggleswade and stays with his Dad once a week to come to this pub. It’s always on my mind that you never get a round in!